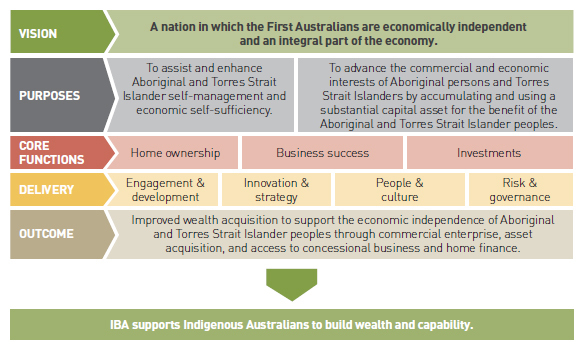 IBA’s vision is for a nation in which the First Australians are economically independent and an integral part of the economy. Established under the ATSI Act, IBA’s purposes are set out in section 146 of the Act and noted in the figure below. Figure 1 demonstrates how we will use our vision to achieve our purposes through delivering our core functions. Table 1 shows how we will resource those functions. IBA serves, partners and invests with Indigenous Australians who want to own their future. We provide financial products and services, and we go further: we invest in people, places and ideas that are ready. The financial success and economic independence of Indigenous Australians is why we exist. direct management and investments that assist Indigenous Australians to access financial returns and employment, training and supply chain opportunities.